I seem to have spoken on here quite a bit recently about the education value of games. It’s true that they can be brilliant, but let’s be honest, there are times when you just want to play a game for fun and you don’t really care if it has an education value or not. That’s certainly the case with Hearing Things. The basic aim in Hearing Things is to read your ten mate’s lips correctly and guess the phrase that they are saying. The team with the most correctly guessed phrases wins the game. Simple. But, oh so hilarious in practice! There are 150 cards in the game and each one has four colours and four phrases on it. What you do is choose one colour each game, that way you end up not repeating the phrases too often. Hearing Things comes with a set of headphones with a one-minute built in timer. When you press the start button on them sounds will play in the headphones for 60 seconds. This means that the person wearing them is unable to hear things that are being said. 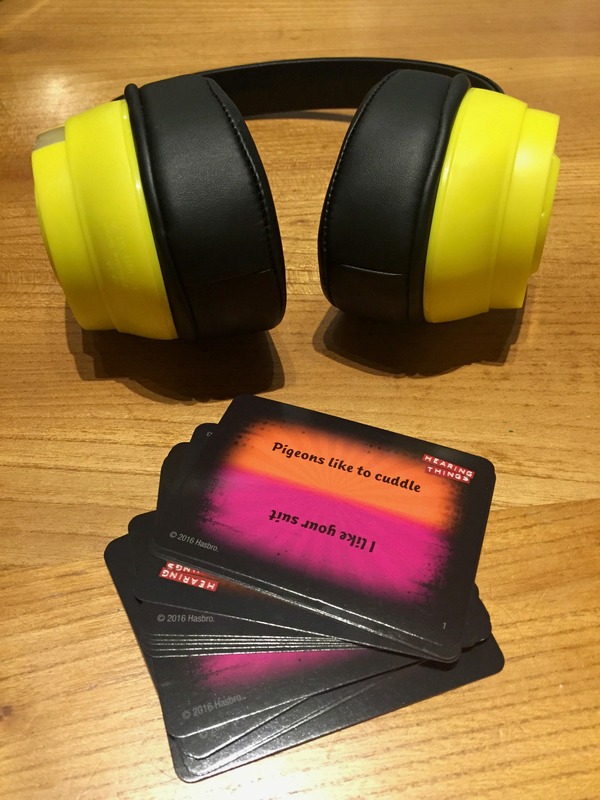 In a team of two one person wears the headphones whilst their team mate reads phrases to them off the cards. They have to guess what they are saying and if they get it exactly correct then they select another card and keep going. You can’t pass and that means that people can start getting quite frustrated with their team mate. One minute is a very, very long time when you don’t know what someone is saying to you. It also seems like an eternity when you are trying to get someone to understand what you’re saying. In a full game each team takes three turns. The team that has guessed the most correctly wins. One other thing I really liked about Hearing Things is the phrases that are on the cards. Some of them are simply hilarious in their own right. Things like: I really want a pet goat or Pigeons like to cuddle. I challenge anyone not to laugh when you hear someone saying things like that. Now imagine someone saying it over and over again. 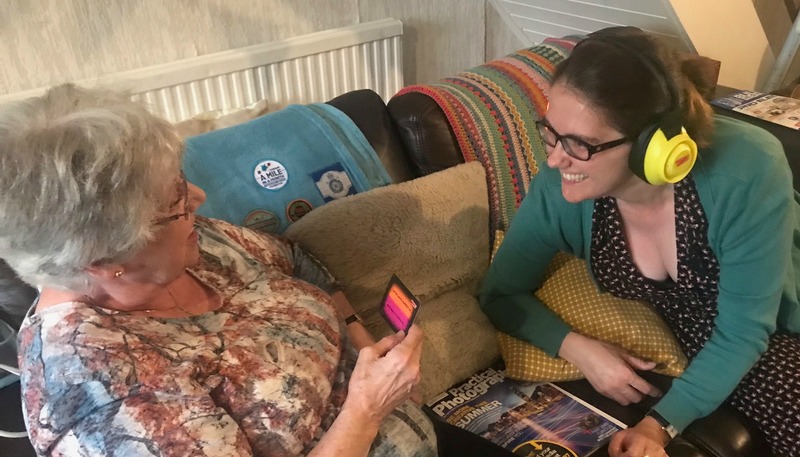 It also makes the game a whole load more challenging when someone is trying to lip read someone who is struggling to say something for laughing. There were genuine tears of laughter when we played this whilst my mum was visiting us. Hearing Things is definitely one that we’ll be pulling out at Christmas time when the whole family is together. I’m guessing that the addition of some alcohol may make it even funnier! 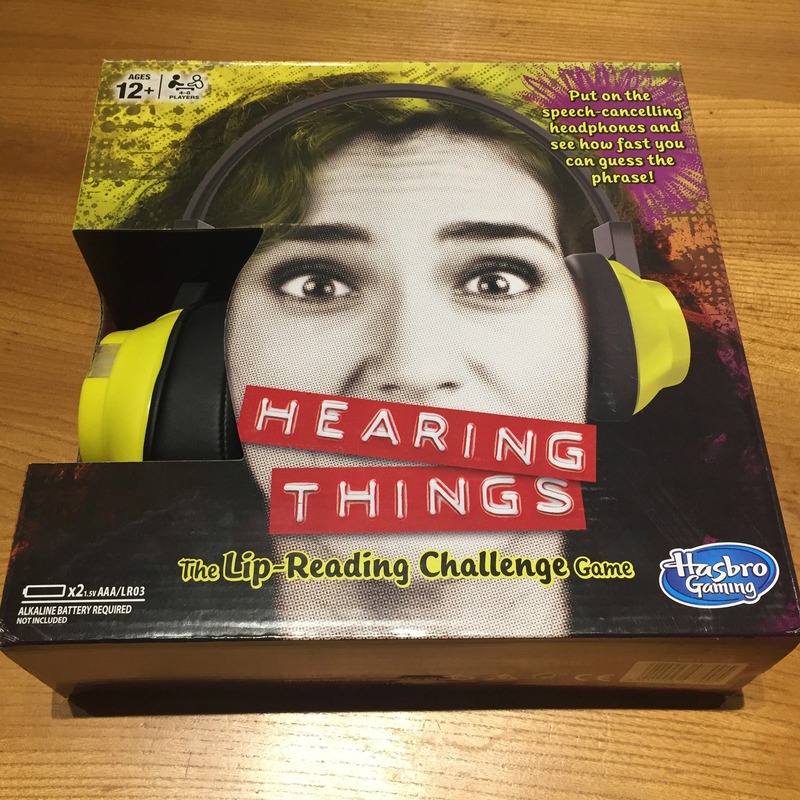 Hearing Things is available to buy online here. Disclaimer: We received Hearing Things as a raffle prize at a recent Blog On Conference. We were not asked to review it, but have chosen to do so. This post contains affiliate links.